Robin Youngs, Edward Fisher,	The Journal of Laryngology & Otology, Volume 127 Issue 5, p 441. E J Maile, R Youngs,	The Journal of Laryngology & Otology, Volume 127 Issue 5, pp 442-447. S K Sinha, A Barman, N K Singh, G Rajeshwari, R Sharanya,	The Journal of Laryngology & Otology, Volume 127 Issue 5, pp 448-451. G Ullas, L McClelland, N S Jones,	The Journal of Laryngology & Otology, Volume 127 Issue 5, pp 452-457. M B Gluth, B Y B Tan, P L Santa Maria, M D Atlas,	The Journal of Laryngology & Otology, Volume 127 Issue 5, pp 458-462. K Otsuka, M Suzuki, M Negishi, S Shimizu, T Inagaki, U Konomi, T Kondo, Y Ogawa,	The Journal of Laryngology & Otology, Volume 127 Issue 5, pp 463-467. E Vuralkan, S Alicura Tokgöz, G Simsek, F Koybasioglu, U Han, M Caliskan, O Besalti, I Akin,	The Journal of Laryngology & Otology, Volume 127 Issue 5, pp 468-472. T F Youssef, A Matter, M R Ahmed,	The Journal of Laryngology & Otology, Volume 127 Issue 5, pp 473-478. P-P Chen, S-M Tsai, H-M Wang, L-F Wang, C-Y Chien, N-C Chang, K-Y Ho,	The Journal of Laryngology & Otology, Volume 127 Issue 5, pp 479-482. T C Biggs, P Baruah, J Mainwaring, P G Harries, R J Salib,	The Journal of Laryngology & Otology, Volume 127 Issue 5, pp 483-488. PD Radford, SN Unadkat, M Rollin, NS Tolley,	The Journal of Laryngology & Otology, Volume 127 Issue 5, pp 489-493. 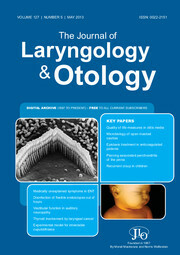 I Rankin, S M Wang, A Waters, W A Clement, H Kubba,	The Journal of Laryngology & Otology, Volume 127 Issue 5, pp 494-500. B Naghibzadeh, E Razmpa, N Amiri, GH Naghibzadeh, F Bandarian,	The Journal of Laryngology & Otology, Volume 127 Issue 5, pp 501-504. Piercing associated perichondritis of the pinna: are we treating it correctly? Z W Liu, P Chokkalingam,	The Journal of Laryngology & Otology, Volume 127 Issue 5, pp 505-508. H Mohammed, P Martinez-Devesa,	The Journal of Laryngology & Otology, Volume 127 Issue 5, pp 509-510. B S Gendeh, F D Zahedi, H Ahmad, T Y Kew,	The Journal of Laryngology & Otology, Volume 127 Issue 5, pp 511-515. J-H Lee, Y-O Lee, C-H Lee, K-S Cho,	The Journal of Laryngology & Otology, Volume 127 Issue 5, pp 516-518. S Urata, M Ohki, T Tsutsumi, S Kikuchi,	The Journal of Laryngology & Otology, Volume 127 Issue 5, pp 519-524. B T Varghese, K P Desai, A Ramachandran,	The Journal of Laryngology & Otology, Volume 127 Issue 5, pp 525-527. S Seng, S M Kieran, S O Vargas, T J Mcgill,	The Journal of Laryngology & Otology, Volume 127 Issue 5, pp 528-530. A Ladak, S Agrawal,	The Journal of Laryngology & Otology, Volume 127 Issue 5, p 531.